Two tick-borne diseases with expanding case and vector distributions are ehrlichiosis (transmitted by Amblyomma americanum) and rickettiosis (transmitted by A. maculatum and Dermacentor variabilis). There is a critical need to identify the specific habitats where each of these species is likely to be encountered to classify and pinpoint risk areas. Consequently, an in-depth tick prevalence study was conducted on the dominant ticks in the southeast. Vegetation, soil, and remote sensing data were used to test the hypothesis that habitat and vegetation variables can predict tick abundances. No variables were significant predictors of A. americanum adult and nymph tick abundance, and no clustering was evident because this species was found throughout the study area. For A. maculatum adult tick abundance was predicted by NDVI and by the interaction between habitat type and plant diversity; two significant population clusters were identified in a heterogeneous area suitable for quail habitat. For D. variabilis no environmental variables were significant predictors of adult abundance; however, D. variabilis collections clustered in three significant areas best described as agriculture areas with defined edges. This study identified few landscape and vegetation variables associated with tick presence. 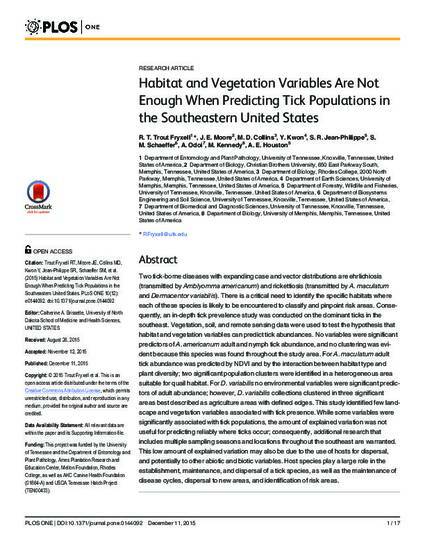 While some variables were significantly associated with tick populations, the amount of explained variation was not useful for predicting reliably where ticks occur; consequently, additional research that includes multiple sampling seasons and locations throughout the southeast are warranted. This low amount of explained variation may also be due to the use of hosts for dispersal, and potentially to other abiotic and biotic variables. Host species play a large role in the establishment, maintenance, and dispersal of a tick species, as well as the maintenance of disease cycles, dispersal to new areas, and identification of risk areas.